Water scarcity in Chinese history is a big issue. China has suffered from water scarcity in the north since ancient times. Summer monsoon winds originating in the Indian Ocean sweep into China. When the summer monsoon is stronger, the moisture-laden winds push the rains farther northwest into China. But when the monsoon is weak, the rains fall farther south and east, depriving northern and western parts of China of summer rains. Recent research on the strength of monsoon rains over the last two millenia has thrown up some interesting results. The research was based on the layers of stone in a 118-mm-long stalagmite dating from 190 AD found in a cave in Gansu Province in China. It has allowed researchers to match, the amounts of uranium and thorium throughout the stalagmite, to tell the date each layer was formed with the “oxygen signature” in the stalagmite that shows the amounts of rainfall—a measure of summer monsoon strength—to those dates. The researchers discovered that periods of weak summer monsoons coincided with the final years of the Tang (618-906AD), Yuan (1279-1368AD) and Ming (1368-1644AD) dynasties, which are known to have been times of popular unrest and social upheaval. In contrast, strong summer monsoons prevailed during one of China's "golden ages," the Northern Song Dynasty (960-1279AD). Without the strong rains, food becomes scarce causing social problems and unrest. Hence it is no coincidence that China's most successful dynasties all fell in times of water scarcity. In the 20th century Mao was greatly aware of the need to keep the north watered, in 1952, he called for a scheme that would divert water from the southern Chinese rivers to the north to ease the growing water shortages in the cities of Beijing and Tianjin and the northern provinces of Hebei, Henan and Shandong. In the 21st century, the mammoth task of transferring water to the north has begun. The South-to-North Water Transfer Project is an incredible feat of engineering on a very grand scale, the aim of the project is to transfer at least 44.8bn cubic metres of water each year from the the Yangtze River in the south, to counter the thirst of the north China plain and its 440 million people. It is the largest project of its kind ever undertaken in the world. The rapid growth of megacities — around 22 million people in Beijing and 12 million in Tianjin alone — has put considerable strain on the ground water aquifiers in the north. In recent years, urban and industrial development has often been supplied with water at the expense of agriculture leading to severe water shortages in rural areas. The project will link China's four main rivers – the Yangtze, Yellow River, Huaihe and Haihe – and requires the construction of three transfer routes, stretching south-to-north across the eastern, central and western parts of the country. In August 2002, the project was approved and work began on the eastern route of the project in late 2002, and on the central route in 2003. The Central route is due to be completed shortly. Work on the western route is more complicated and is not due to be completed until 2050. The project has been criticised for its lack of concern for the environmental impact and the human impact on people being relocated to make way for the canal on the central route. Questions about the cleanliness of some of the water being transferred have also been raised. In the US, the New York Times said the project was like "...channeling water from the Mississippi River to meet the drinking needs of Boston, New York and Washington." Nevertheless, it is clear, that if China is to continue its growth and development in the 21st century, it must resolve the problem of water scarcity in the north. With 22pc of the world's population, China has only 8pc of the world's fresh water which adds to the challenge. Its per capita availability of fresh water is barely a quarter of the world average. Furthermore, the north accounts for around 37pc of the country's total population, but has only 12pc of the country's total water resources. Yet, in the south, about 1,000bn cubic meters of water from the Yangtze River empties into the sea each year. There is no easy solution to this geographical conundrum and the scale of the problem is huge. The Geo-Trade Blog believes the South-to-North Water Transfer Project provides a practical solution to a tricky geographical problem that goes back thousands of years. 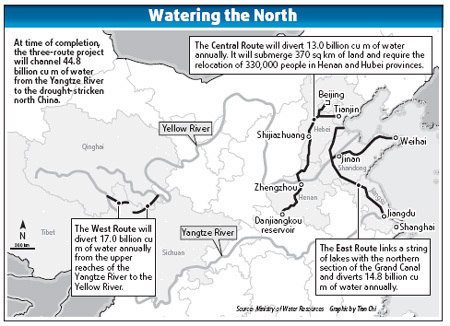 The water transfer project appears to be a logical trade-off as long as the north continues to play fair and does not take advantage of the arrangement to develop further at the south's expense by taking a greater share of the water from the Yangtze River. Although if water remains at present levels, there appears to be enough water for all.